The circus is in town! Cirque du Soleil are here in Hong Kong, and provided good Saturday night entertainment for my boyfriend and me. I absolutely love Cirque du Soleil: the costumes, the jovial atmosphere, the incredible acrobatics. But I’m also a very nervous viewer. I find a lot of the acts quite death-defying, and am in a state of terror throughout. No number of safety wires, no thoughts about how many hours they’ve spent practising, will convince me that the acrobats will not plummet to their deaths in the performance. In a professional, reputable organisation like Cirque du Soleil the fear is slightly more bearable, but last year on holiday in Shanghai we went to see some Chinese acrobats with lower production values, and it may have been the most terrifying experience of my life. There was the “fiery hamster wheel of death” (a large ferris wheel-esque contraption, with men running in each carriage and leaping out at the top whilst skipping or JUGGLING FIRE) and the spherical motorbike cage with eight (EIGHT!) motorbikes looping around inside it. It’s not only a wonder that none of the acrobats died, it’s frankly a miracle that I didn’t have a heart attack in the audience from the nerves! The terror in no way lessens my enjoyment though, if anything it makes me admire their skill even more and I always leave with an extreme sense of relief and euphoria that we’ve all survived. The show this weekend was bright, colourful and a bit eighties. The visuals were really stunning, and put me in mind of this similarly vibrant dish. Don’t you feel virtuous just by looking at it? It’s chockful of goodness and looks really bright and summery, yet the warmth and spiciness make it ideal for winter too. 1. Heat the oven to 200C. 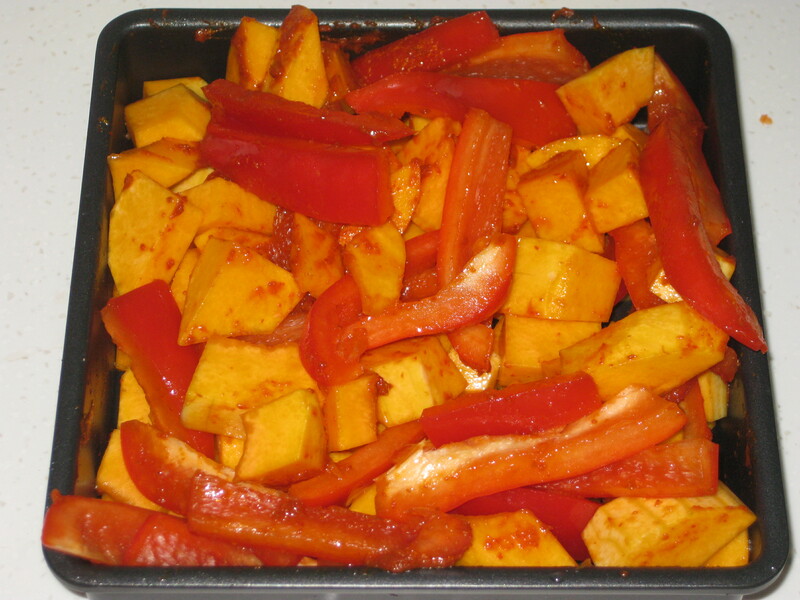 Toss the squash and pepper in the harissa and oil in a large baking tray. Roast for 20 minutes, until soft. 2. Meanwhile, put the bulgur wheat in a large bowl and pour over the hot stock, then cover and leave for 15 minutes. 3. 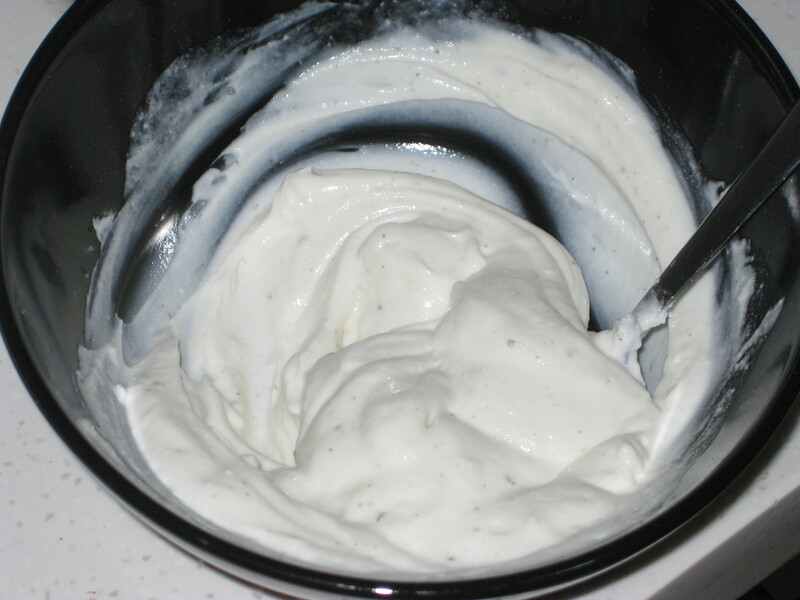 In a separate bowl, mix the garlic, lemon juice and yoghurt together. Season well. 4. 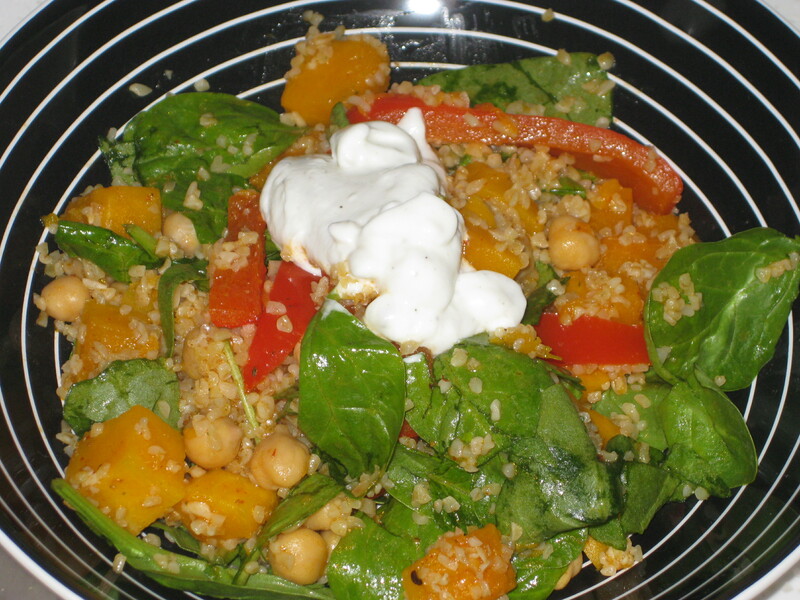 In a large bowl, toss together the bulgur wheat, roasted vegetables, chickpeas and spinach – I like my greenery, but this was too leafy even for me, so I’ve reduced the amount of spinach for next time. Drizzle with garlicky yogurt and serve warm. 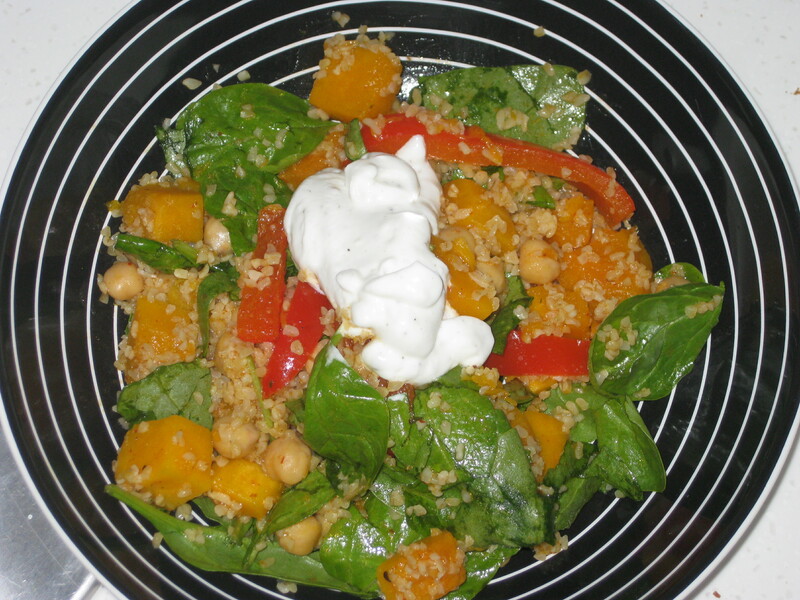 This entry was posted in Vegan Recipes and tagged bulgur wheat, butternut squash salad, cooked salad, harissa salad, spicy salad. Bookmark the permalink. That show in Shanghai sounds pretty awesome! Those guys are brave! 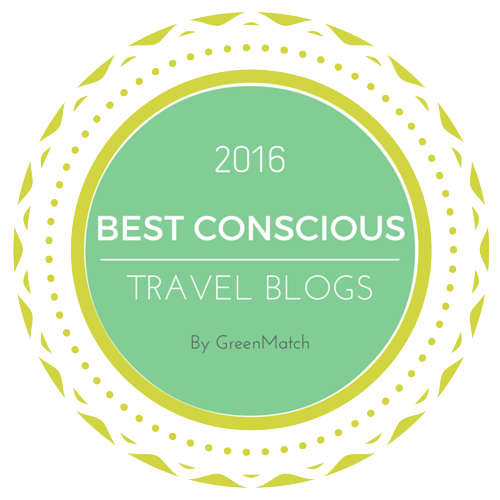 Brave/crazy – it’s a very fine line! Me too, I LOOOOOVE Cirque du Soleil, and have seen several shows in Vegas and tent shows in SF too. My kids have seen the DVDs and they are like mesmerized. Haha. 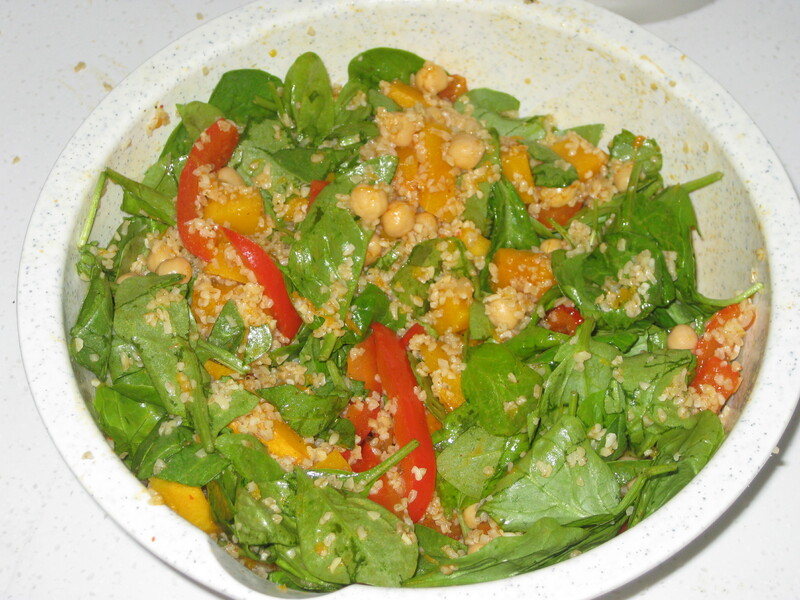 This salad looks delish! Thanks Nami. I can’t even imagine seeing Cirque du Soleil as a kid, it must be even more mind-blowing! I LOVE cirque du soleil! It’s always so entertaining. This salad sounds so delicious! I can’t wait until winter squash is back in season here. 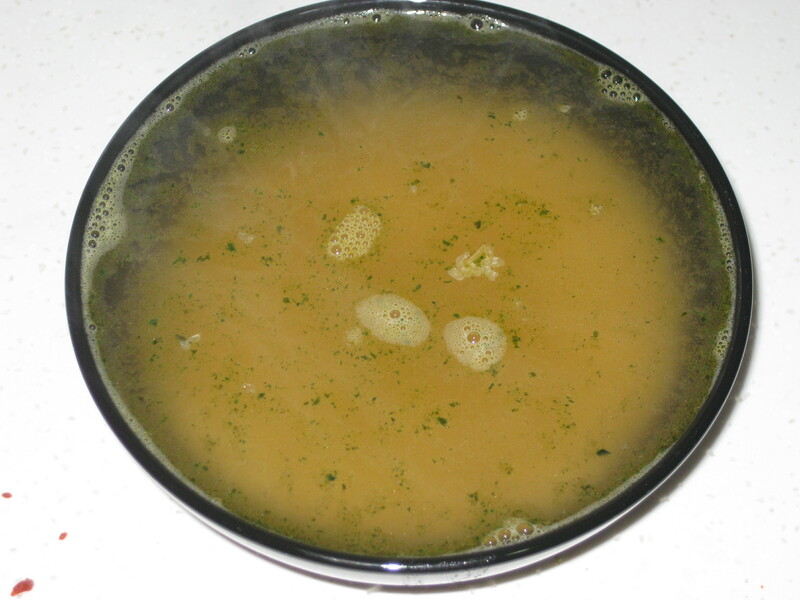 It is very tasty, definitely keep it in mind for the winter months!